I’ve always loved ferns, so I was thrilled when I found they grew wild in shady spots here. Along the corridor to the east side of the house, and more successfully between the decking boards outside the kitchen door, two or three different varieties grow with minimum involvement from me. Strap-leaved Hart’s tongue, the common Shuttlecock Dryopteris felix mas and Dryopteris affinis grow happily, their hairy croziers heralding spring, encouraging me to cut back the old leaves to get a good look at the new. They spore happily under the deck – an ideal spot: dark, and for most of the year, damp. When these plantlets stick their heads above the decking, I gingerly tug them up from their concrete bed, and try to re-locate them to other bits of the garden. They’ve done well under the oak tree, so I felt encouraged to create a small fernery in a dark north-facing corner behind my late husband’s memorial stone – a massive slate menhir or standing stone, created and inscribed by designer and stonemason Gary Breeze. 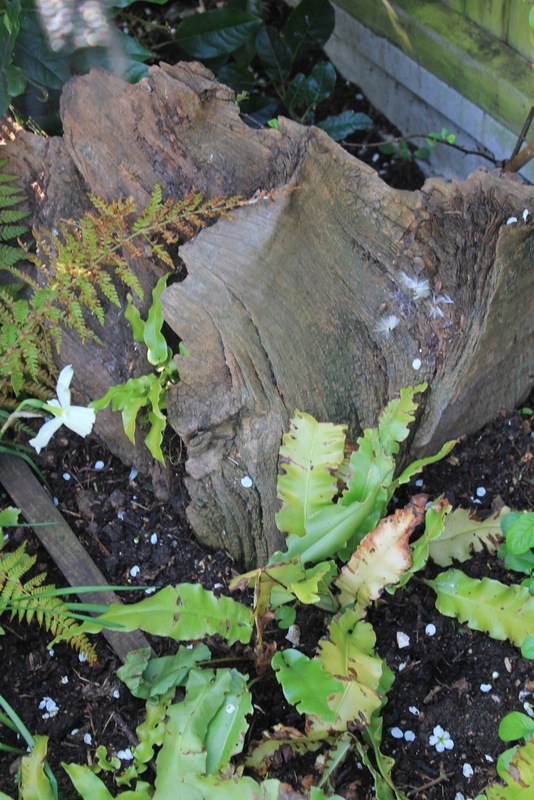 Filling the bed with our compost and leafmould (see Feb’s blog), I’ve planted out a collection of ferns that I’ll have to remember to keep wet once the inevitable drought hits later in the year. I’m hoping to encourage moss that will probably disappear during the summer, so they’ll be winter annuals. A job in progress, netted now to prevent involvement from hens and cats, but a spot I hope will be a place to relax with the addition of a suitable chair. PS. Come and view progress when we open our garden for the NGS on May 19th .